And just like that summer has come to an end... Whether you are going back to school or heading back to work, it's time to pull yourself together and look more professional. I have teamed up with Old Navy and styled a few of their pieces to create a business casual look that will sure to leave a lasting impression. I am wearing a striped top, polka dots chiffon skirt, and a classic blazer. I complete the look with a bag I customized and designed myself (you can read about that here). Looking professional doesn't mean looking boring, you can have some fun by mixing prints and playing with colors. So, put those sandals away and grab a blazer! Boat neck striped top c/o Old Navy. 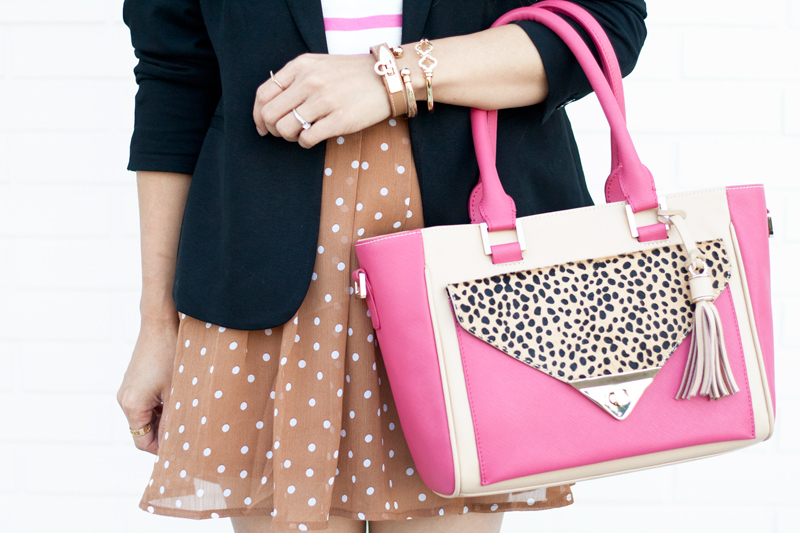 Polka dots chiffon skirt c/o Old Navy. Classic blazer c/o Old Navy. Customized bag c/o Wink & Winn. Buckled leather bracelet c/o Sole Society. Ball out cuff bracelet c/o Anarchy Street. Cut out signature bracelet c/o Fornash. Greer v-neck necklace by Gorjana c/o Rocks Box. That buckled leather bracelet is adorable!